I always liked such sites. Probably there are a lot of them out there, but recently I found that one – toondoo.com and within 2 weeks I found that they upgrade the service and it become very advanced. There a lot more things. This also inspire me to start my own comics blog. You can find my “art” at comics.chankov.net. This entry was posted in External Sites, General, Tools and tagged comics, External Site, Tool, toon on March 16, 2008 by Nik Chankov. Last Friday I found quite nice service for vectorization of raster images. The service is provided from University of Stanford. 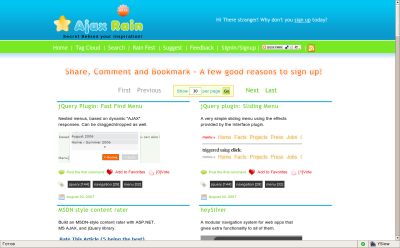 The front end is written in flash or flex and the interface is very intuitive and easy to be used. There are input image detection, quality levels and also ability to edit the preview of the image. The supported input formats are JPG, GIF, PNG, BMP, TIFF and EPS, SVG, PNG are the output formats. The comparison results showing that this tool is better than Adobe and Corel alternatives. This service seems to be already very popular – according to their blog there are already 1,000,000 uploads. Update: The service becomes paid. Although you have 2 free credits while you sign up. This entry was posted in External Sites, General, Tools and tagged External Site, Transformation, Vector Images on February 11, 2008 by Nik Chankov. I found this site clicking on the AdSense banner. It’s called Dapper.net and here I will explain what is this service. It’s quite strange to find a non-profit site in AdSense block /at least this is my experience so far/, but this is the truth. The first impression was that it has quite neat and clean design and I wanted to understand more about it. So what I found? Dapper is a web 2.0 application which extract the specified content from a site and create information source /dapp/ and store it as XML, which could be used from third party applications and sites. This entry was posted in External Sites, General, Tools and tagged Dapper, External Site, Information library, Web 2.0 on October 20, 2007 by Nik Chankov. Today … is the first day after my trip in Greece. Well it’s hard to be in good mood after a holiday and I couldn’t code as fast as I want for these first days, but this is another story. I would like to share here some information about a marketing tool which I just saw. It’s called ClickHeat. What is the main purpose of that tool? People which using already Google Analytics could see many things which are the same, but in fact there are differences which I am going to mention.